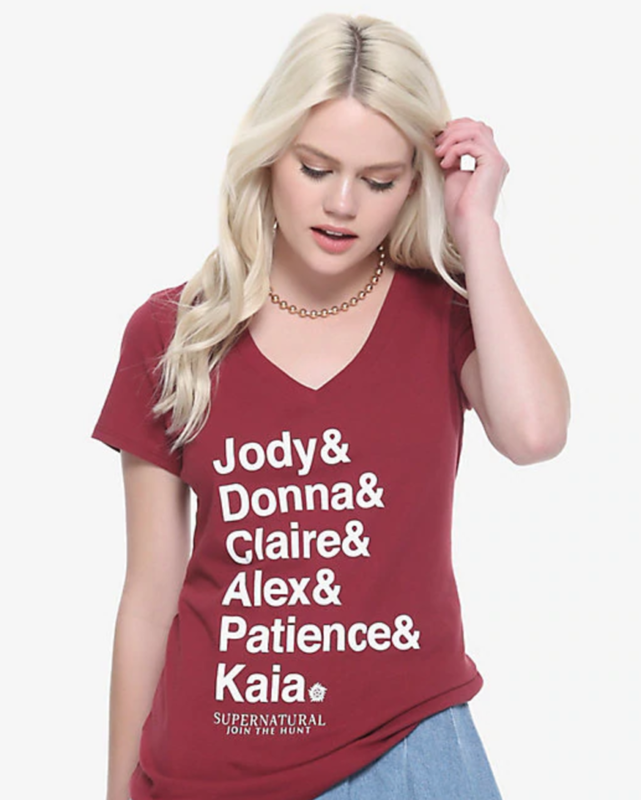 Heads up Wayward Sisters fans, Hot Topic (AKA fandom heaven) has just released a new shirt with the names of all six of our favorite Wayward ladies. The style is popular amongst fandom clothing. Jody Mills. Donna Hanscum. Claire Novak. Alex Jones. Patience Turner. Kaia Nieves. This red V-neck gives it up for Supernatural‘s Wayward Sisters. It’s incredible to see Hot Topic, which has been a go-to provider of officially licensed Supernatural products for years, supporting the Wayward ladies like this. Now is our chance to show them (and potentially Netflix) that we still want to see more from Wayward Sisters. So head on over to the website and grab yourself a shirt. As of now they are available in the sizes small, medium, large and extra large. To request an additional size, you can contact Hot Topic through their Twitter page. If the shirt sells well and gains enough interest, there’s a chance we may see more Wayward Sisters merchandise in the future. If you purchase one, let everyone know! Share the link, and while you’re at it, tag Netflix, use the hashtag #SaveWaywardSisters and share why you want them to pick up the show. A little positive noise only helps the cause. Alana is a YouTuber, aspiring filmmaker, and avid reader. She currently majors in film & television, and minors in social media & digital strategies. You can normally find her creating videos about her favorite fandoms which include Supernatural, Harry Potter and Marvel among others. You can find her video work at http://youtube.com/c/kingbooks.